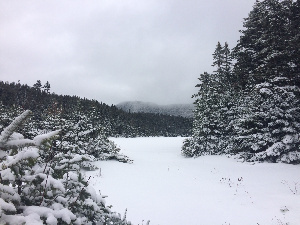 Two of us hiked about 8.5 miles on the Notch Road to Sterling Pond on Saturday, December 2, 2017, as the conditions were not good for nordic skiing. The weather was perfect - no wind and temperatures in the low 30's. 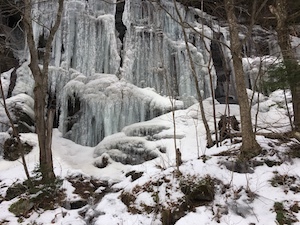 I parked on the Stowe side of the Notch Road and met Anne on the Cambridge side, where she had parked, at a lovely icicle waterfalls on the east side of the road. 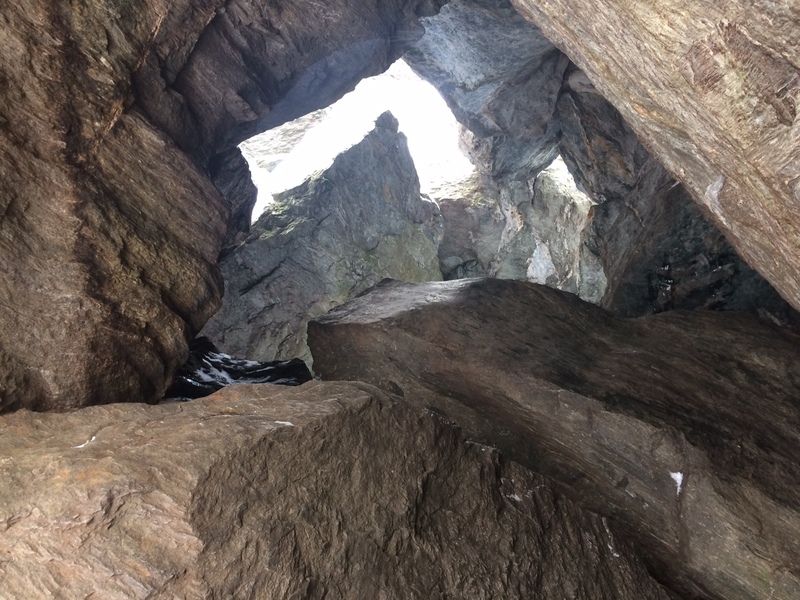 We returned to the height of the road and walked the short distance to Smuggler-s Cave. Then we hiked up to Sterling Pond. The trail was well packed, but our footing was secure with microspikes under our boots. 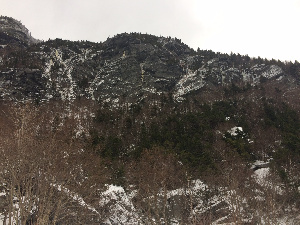 We lost the Long Trail at the Smuggler's Notch downhill area and retraced our steps, continuing south to the junction of the blaze trail to Sterling Pond, which is opposite the Long Trail/Elephant's Head Trail. We considered taking the blue trail back to Sterling Pond, but deep snow and my late afternoon commitment deterred us. Although we could see brown fields in the valley below, we would have been thigh deep in snow on this section but for a skier who had packed down the trail between the junction of the Sterling Pond Trail and the Long Trail north to the junction of the blue blaze trail to Sterling Pond and Elephant's Head. Yes, next time carry snow shoes. On the descent of the Sterling Pond Trail, we took plenty of time to gaze at the mountains north, the valley below, and the rocky, snowy and icicle-covered wall across the road below the Mansfield range. It was a truly magnificent early winter hike.